FORT LAUDERDALE, Fla. -- At least two people are dead and a third person is missing after a red Jaguar crashed into a South Florida canal, authorities said. A Broward Sheriff’s Office news release said the car left the roadway, crashed through two chain-link fences and plunged into the water in a residential area near Fort Lauderdale early Monday morning. Witnesses said the red Jaguar was doing well over 100 mph when it slammed through the fences, CBS Miami reported. One man was able to get out of the car and swim to safety, the Broward Sheriff’s Office said. The man told authorities that another man and two women remained in the vehicle. The sheriff’s office aviation and marine units responded. Divers found the submerged car -- tangled in thick, long weeds -- with a man and woman inside, but they were still looking for the other woman later Monday. Some people said they saw the car speeding. 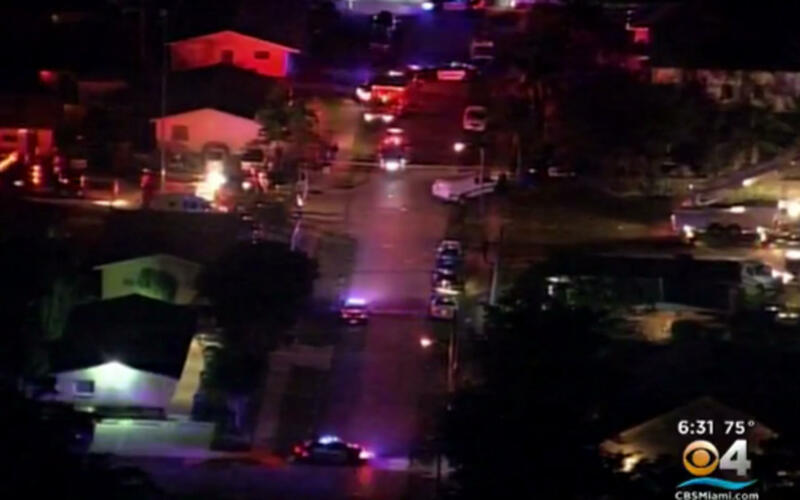 “They were driving around the neighborhood crazy fast, they don’t stop when they make the turn,” said Tim Ibrahim, a clerk at a store near the site of the incident, according to CBS Miami. On a store security video, the Jaguar can be seen speed out of the parking lot at 4:41 a.m.
“It didn’t stop, I didn’t see no brake lights,” said Shanicia Bucknor who was sitting outside with neighbors near the crash scene. Area residents jumped into the water to help and were able to pull the driver from the car. He was taken to the hospital. He said another male and two females were in the car. Family members of those in the car raced to the scene when they heard what had happened and prayed for a miracle. Wanda Hodge said it was her nephew behind the wheel. Hodge said he told her there was a problem with the brakes as he got closer to the lake. “He said he just kept trying to mash the brakes and the brakes just gave out, he wouldn’t stop,” she explained. Officials haven’t said what caused the crash or named any of the car’s occupants.